Laurel Stone and Aiden Gallagher have a lot of history, some of it good, some of it not so good. First as children in a picture that has become the iconic representation of the town of Darling, Vermont; then as high school friends and later enemies. Both have also gotten a few life experiences under the belts. For Lauren, having her marriage end in a tabloid-style way and having to return home was not part of her plans, but she’s making the best of her situation and trying to deal with her emotional wounds. Aiden is a constant reminder of the heartbreak and humiliation he dealt her back in high school and her revived feelings for him are very inconvenient. Aiden has always regretted the role he played in the fallout with Laurel, but never got a chance to apologize, but fate has given him the perfect opportunity to do so and spending time with her only increases the intensity of his feelings for her. Okay, this book was all kinds of cute and sweet and fun, but it was also a bit emotional for me. Laurel’s struggle to deal with her sense of betrayal by her ex-husband, the blow her self-confidence and self-esteem and having to keep her head up in the face of the gossip and everything going on, got to me. Aiden was one of the few that saw through the facade she put up to the hurt beneath and really put himself out there to earn her forgiveness for the juvenile stunt he pulled. Both Laurel and Aiden experience a lot of personal growth and I enjoyed how they supported each other. Like there wasn’t enough between Aiden and Laurel to make you tear up, the way both of them reached out to a homeless man and gave him some dignity was so heartwarming and also a clear example the kind of good and caring people they were. The ending was straight out of a fairy-tale and just perfect for them as a couple and hit all the high notes for me – family, friendship, community, emotion and romance. This book made my heart hurt and then smile. 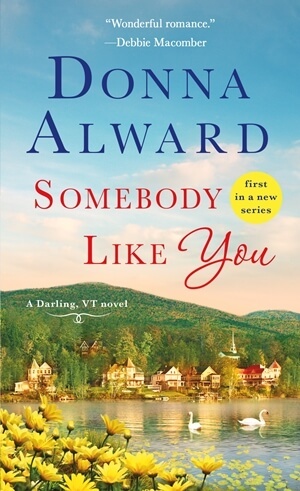 SOMEBODY LIKE YOU is a really great start to this series and I can’t wait for the rest of the series. While bestselling author Donna Alward was busy studying Austen, Eliot and Shakespeare, she was also losing herself in the breathtaking stories created by romance novelists like LaVyrle Spencer, Judith McNaught, and Nora Roberts. Several years after completing her degree she decided to write a romance of her own and it was true love! Five years and ten manuscripts later she sold her first book and launched a new career. While her heartwarming stories of love, hope, and homecoming have been translated into several languages, hit bestseller lists and won awards, her very favorite thing is when she hears from happy readers!